1. The Hero Rudra: Directly out of the Greek tragedies of the Classical Period: Predestined , fate laid out before he is born, doomed yet heroic because he will fulfil his destiny come what may. Bonus : He speaks less and expresses more. 2. There is a story & it has pace : Every scene has something significant happening. Tears are not dropped in excess. Abs are not flashed for catching adolescent eyes, conversations are not carried on to wile away screen time. If you miss an episode, you are left behind. 3. It is Intelligent : You don’t have to leave your brains in the other room like you do when you watch other shows. In Fact brains are a must. There are secret societies, there is an ancient legend and there is a forthcoming Event. You, as audience, are to make the connection . A little piece of that puzzle is thrown into your hands too, figure it out! 4. It’s real: The saris are not banarasi, the women are not painted. The ghats are not made of studio card boards and the actors are not plastic. When Rudra jumps from great height into the Ganga, you feel the impact..perhaps even a few water drops splash on your face? That real. 5.The 5th & the final reason is very simple: It is NOT about a woman martyring herself to please everyone in her extended family, who are busy plotting against her. YES! It’s Indian TV and it’s about something else rather than the eternal suffering of the ideal bahu. Hallelujah! The change is near! 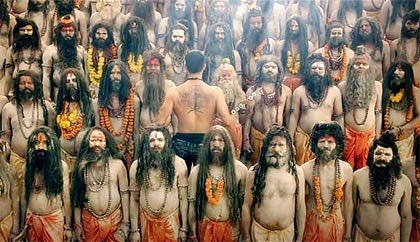 « MahaKumbh : The biggest show on Indian Television?